In recent years, universities and colleges are including civic engagement in their mission statements. University administrators are increasingly encouraged faculty and students to participate in civic engagement both on and off campus. Various stakeholders should be part of this conversation in order to create a setting for learning that reflects the mission of the university or college. In this study, sixteen university freshmen participated in civic engagement through a freshman honors forum course. In addition to promoting civic engagement, the course supported the arts and museums in Memphis, Tennessee. Pre and exit surveys were conducted the participants to gain insight into their thoughts and experiences towards the course's curriculum. Their experiences provide a window into thinking about the role of civic engagement with university students. Ostrander (2004) writes the idea of community engagement has been an aspect of university circles for many years. Shelton (2016) points out common civic engagement could involve off-campus student housing, campus expansion, or student conduct. These forms of engagement still exist but more universities are expanding the cooperative mindset and are creating new positive interactions from the classroom. The interactions can be guided by integrating community concerns into intellectual life (Ostrander, 2004). Heiland and Huber (2014, 2015) and Ostrander (2004) discuss that institutions of higher education are giving more attention to civic learning and engagement. Curriculum transformation is a common way to introduce students to community- based learning and engagement. Also, more professional organizations are devoting conference presentations to the topic, publications in academia are being showcased in issues and the literature is growing. Furthermore, there is enough advancement on university campuses that the Carnegie Foundation for the Advancement of Teaching developed a “Community Engagement” classification (The Carnegie Classification of Institutions of Higher Education, 2015). In order to receive this classification, campuses must document aspects of their commitment to community engagement through various means including the mission statement, engaged faculty scholarship and student learning. It should be mentioned the Carnegie Classification is “community” rather than “civic” engagement. However, researchers Finley (2014) and Heiland and Huber (2015) discuss that both community work and civic work may include service-learning and ways to develop skills which foster civic living. 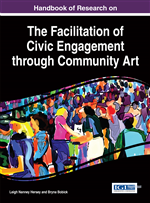 This chapter intends to describe the promotion of civic engagement and the arts through a university undergraduate curriculum course. Ehrlich (2000) defines civic engagement as a means of working to make a difference in the civic life of our communities and developing the combination of knowledge, skills, values and motivations to make a difference. Also, it means promoting the quality of life in a community, through both political and non-political processes. The researcher engaged university course participants in a qualitative action research study during the 2015 fall semester. At the beginning of the semester, participants took an entry survey that noted previous civic engagement and museum experiences. The survey asked them to describe participation museum community activities, use of social media involving museums and their overall experiences in museums. At the end of the semester, participants completed an exit survey to determine what aspects of the course made a lasting impact and any increase or decrease in civic engagement. The results and information gathered from the survey data will aid in future curricula development, ways to foster civic engagement. Linking university classes to the arts and civic engagement can be practical and enable undergraduate students to view their education as a communal act that values and respects society. Levine (2013) writes there have been reforms of colleges and universities that connect them better to their surrounding communities. Also, higher education is being redesigned as a result of calls for greater engagement with communities (Nicotera, Cutforth, Fretz, & Thompson, 2012). Colleges and universities have sought to broaden their mission to become engaged partners in addressing community needs and issues (Wertheimer, Beck, Brooks & Wolk, 2004). The various terms used to address this change include: the engaged campus, experiential learning, service-learning, community engagement, or civic engagement. Borwick (2012) mentions that an institutional view of “self” as a responsible member of the community will also serve as a way of establishing credibility with stake-holders. Such efforts can serve as a first step in civic engagement. Boyer (1990) suggests that a new scholarship of civic engagement is needed, one that supports building bridges between theory and practice, communicating research knowledge to students and valuing the results of scholarly work. Strategies for Civic Engagement: Opportunities and ways to involve community members with civic engagement. Urban Education: Education that occurs in an urbanized area and inside a city. University Curricula: A sequence of courses taught to university students and should relate to the university’s mission statement. Community engagement: Engaging community members in a capacity building. project that benefits stakeholders in a community. The stake holders should be involved the decision-making and the engagement should foster positive relationships with all parties. Honors Forum Course: A one hour college credit course taught to undergraduate honors students. Museum Education: A field of study focusing on developing a museum’s role in the community by engaging community members with various museum experiences and activities. Survey Research: A form of research that delves into the thoughts and opinions relating to a specific topic of the participants.